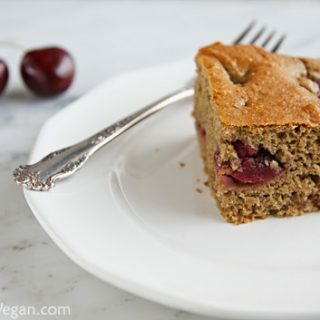 Sweetened only with fruit juice and maple syrup, this moist, vegan cherry cake makes an excellent breakfast or dessert. Imagine a room filled with over 200 people who, at first glance, seem to be total strangers but who over and over, one by one, are revealed to be people you know, whose lives and words you know, though until now you didn’t know their faces. And imagine that they, after a quick glance at your name tag, are discovering that they also know you. Surreal. Your head starts to spin and…you’re overwhelmed. That, in a nutshell, was my experience at VVC and I’m guessing that I wasn’t alone. I may have had a slightly more advanced case of The Overwhelms because the only things keeping me on my feet were two types of antibiotics and various sinus medicines. That the doctor allowed me to fly with a sinus infection was a minor miracle (and probably a mistake), but I didn’t want to miss this unique opportunity to connect with so many bloggers and writers who have entertained, enlightened, and inspired me. Here’s the part in the story where I should start naming people, but if I did, I could go on for paragraphs and still leave out important people: people whose names I didn’t catch, people I spoke to in a large group over a meal, people who told me that FFVK was one of the first blogs they ever read, people who belong to my Yahoogroup, people who lost weight following my recipes, people who don’t believe in low-fat diets but like my recipes anyway, people whom I smiled at goofily but didn’t have the nerve to speak to. Since I can’t name everybody, I won’t name anybody, but I want you to know that if I met you, you made an impression on me, and I’m grateful to have had the chance to spend some time with you. I took exactly one photo the entire weekend, but it’s appropriate that it was of the three founders and organizers of the conference, Janessa, Jess, and Michele. They did such a great job of organizing everything that it’s hard to believe it was a first-time conference. (My daughter particularly wants me to thank them for the Dandies vegan marshmallows in the swag bag–we can’t get them here). Ladies, you made 200-something attendees and one 14-year-old future attendee very happy. It was the kind of inspiring, uplifting experience that none of us will ever forget. It took me an entire day to get back to Mississippi and a full day of bed rest the next day to recover, but after that, it was right back into family life. Put the oats and flax seeds into a blender and grind until they are fine. (If you are using ground flax, no need to grind it--just add it with the other dry ingredients.) Stir a couple of times to make sure that they’re uniformly ground. Mix the oat flour with the other dry ingredients. 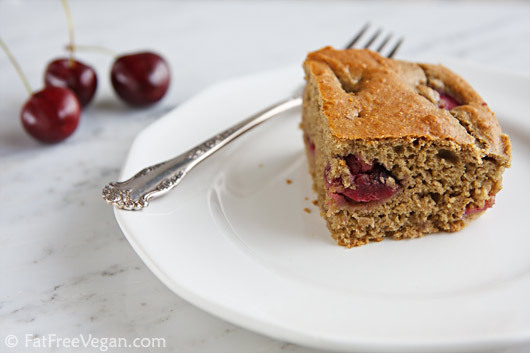 Make a well in the middle, add the remaining ingredients, including cherries, and stir until moistened and completely combined, but don’t over-mix. Pour into the prepared pan (batter will be thick). Do you suppose it freezes ok? We have been on a major freezing spree gearing up for back-to-school. Looks delish! Loved your take on VVC. So sorry you were sick! It sounds aweful. And the cherry cake? I think I’m gonna have to make that this weekend. I’ve got new neighbors and I’m trying to wow them with healthy food. I can’t wait to try this with apples, peaches, and especially blackberries! I have great sympathy for E. as I had braces for 3.5 years- yes, that .5 is important. I got them in sixth grade and they ruined my trumpet-playing mouth forever, but gave me a beautiful set of teeth for the next 13 years through to now. And since I became a professional (opera) singer, not a trumpeter, I’m very glad for them. Popsicles helped at the time. And special dates with Mom on those days when I had to get an adjustment- just a hint! Thank for the hint, Claire! I will definitely start planning special dates. One of my big worries is that it will affect her clarinet playing. I’m hoping the problems she’s having will go away with time. I was thinking last night that I needed to figure out what to do with the abundance of peaches I have. I am going to try to make this substituting peach juice for the liquid, peach chunks for the cherries and peach butter I made yesterday for the applesauce. It should work? It should work fine! My big secret is that I use this basic recipe over and over with whatever fruit I have on-hand. Just don’t leave out the lemon juice–the acid is important to get it to rise properly. 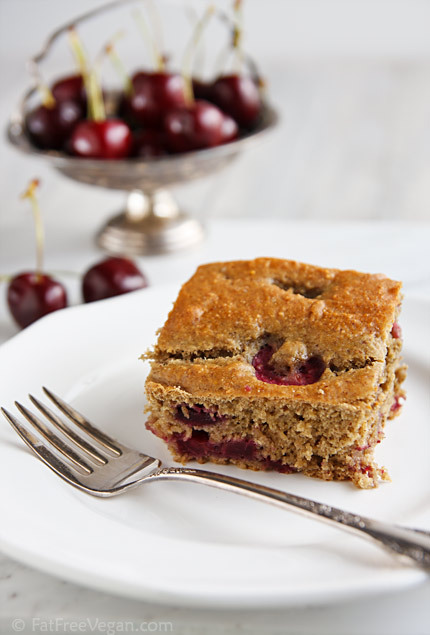 OMIGOSH a cherry snack cake made with pom juice? This looks great! What a beautiful recipe, Susan. I had no idea you were sick at VVC. You are a warrior! I was so thrilled to attend your session and finally meet you, someone I admire so! It was so cool to meet you, and I totally agree with being overwhelmed! Talking to someone and then realizing that you know them is pretty weird, then if I didn’t know them I felt embarrassed. And it also felt like everyone knew everyone, but then, I did too! It was a ton of fun! I agree that VVC was overwhelming but amazing — I’m so glad you were able to travel and participate on the panel, but sorry you weren’t feeling your best. But there’s always next time to look forward to! I’ve recapped Day 1 (http://tinyurl.com/3cd2dy7) and am working on day 2. So much to compress into a post. I should just stop and go make some cherry snack cake! Not only is it free of refined sugar, but also oil. Thank you!!! I am starting the Esselstyn heart prevention diet, which does not permit any added oil. Can you recommend other baked goods from your collection that would fit the bill? You’ll be happy to hear that none of my baked goods contain added oil (or at least I can’t remember any that do). Take a look at my dessert section, and enjoy! I have several coffee cakes that double as breakfast or dessert, too. DEFINITELY making this during this long weekend – sounds DELISH! Susan, I so wanted to talk to you at VVC but I never got the chance. I wanted to thank you, because your blog is what “started it all” for me. Working backwards: I’m currently writing my first cookbook, which is due out in 2012. I scored the cookbook deal because I quit my 4-year life insurance job about a year ago to attend culinary school. I worked up the nerve to do so only after 2+ years of blogging. The whole reason I started my blog was because my interest in vegan food took off. And the first thing that brought veganism to my attention was your blog. I still remember the day in 2007 when StumbleUpon landed me on your Sicilian Market Pasta post, and I went home that night and fixed it immediately. That meal was the beginning of it all for me. So thank you so very much for doing what you do. I hope someday we do get to meet and talk! Snack Cake looks great! I might try it GF. LOVING everyone’s updates from Portland! Sounds like a really fun time. I was so glad to finally meet you Susan! Your blog has always meant so much to me, and it felt like meeting a mentor. 🙂 Hope to see you again sometime when we can talk more. I loved reading your recap! It sounds like so much fun and from reading through Gena’s Choosing Raw blog the food looked to die for! I wish I could have been there just to eat the food lol. I now want to visit Portland because it looks like it has a ton of great vegan restaurants. 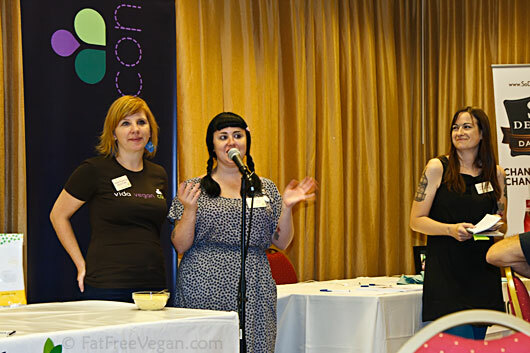 I was really happy to see in the pictures on Gena’s blog and in your pic above that there are other voluptuous vegans out there! Sometimes I feel people expect vegans to be really skinny and that there’s something wrong with me for not being really skinny. Seeing other voluptuous vegans looking comfortable in their skin makes me feel better about myself. Btw, this snack cake looks super delicious and I can’t wait to try it! I’m totally making this over the long weekend – with end of season mangoes from my yard! I know I’m going to have a great grab-and-go breakfast all next week! Such a health giving vegan bread. Perfect for my diet program. no fresh cherries- can i use dried (not sweetened) or should i buy frozen? how much of the dried do you think would work? always looking for new treats to bake for my coworkers and friends- and then reveal the vegan secret! I think either dried or frozen will work, though frozen will be more nutritious (dried usually have added sugar). If you use dried, I suggest between 1/2 and 3/4 cup. You could also try re-hydrating the dried cherries in hot water before using. Are you figuring old points or PointsPlus? This looks really good. This recipe uses the new PointsPlus. Hope you enjoy it! anyway, you are one of many I wish I had time to get to know – there’s always 2013, yes? I wish I’d gotten to talk to you, too! I can’t wait for 2013! Wow, that looks amazing. I showed it to my kids and they’re begging to me to make it, so I’m heading off to the grocery to pick up the ingredients I don’t have! And I have to say again how wonderful it was meeting you. You’ve been an inspiration to me for many years, and I know when I’m drawing a blank in the kitchen, I need to only pull up your site for some wonderful recipes and ideas! i don’t have any flax. can i sub chia instead? should i grind it first? You can sub chia and you don’t have to grind it first. You can add it whole to the other dry ingredients or grind it with the oatmeal. I think 1 tablespoon should be enough. One more question. If I use all purpose flour do I omit the baking powder & soda? No, unless you’re using self-rising flour. I made the cherry snack cake over the weekend and it came out perfectly! I used a metal pan, and tested it after 20 minutes per your advice, and it was just right. It’s the perfect mid-afternoon snack. Thanks for a great recipe! The photography workshop was really helpful. I’m looking at my photos differently now. So glad I got to meet you! this looks so delish! I have everything except the cherries 🙁 so I might have to make a blueberry version!! This looks fabulously good. It is my husband’s favorite cake. I think when I make this, he will fall in love with me all over again! So sweet of you to bake a cake for E after your whirlwind trip while being sick and still recovering. You qualify for the Mother of the Year award for that! Thank you so much for the links to the blogs with photos of VVC. I was so sad to have to sell my ticket last minute, but can’t wait til 2013! It was such an incredible joy meeting you, Susan! It was one of the highlights of my VVC experience. The cake looks super yummy! My patients will love this site. You have great insight. If I used Grapefruit Juice for the fruit juice in this, and just added some extra, could I skip the lemon juice, or would that not be acidic enough? And…I’m trying to find a good recipe for a healthy, low-fat snack to take on a backpacking trip. Would these travel better than your Blueberry-Oat Bars, or should I maybe try the Blueberry Breakfast cake? Thanks, this site is AWESOME!!! I think the grapefruit juice will probably work. My hunch is that the Blueberry-Oat Bars would travel better, though if you can pack it in something rigid, this would probably be portable, too. My best snacks for backpacking, in my opinion, are Banana-Cashew Balls and Cherry-Date_Nut Balls. Thanks for the speedy reply! 🙂 I will try the Blueberry-Oat bars. I would love to try either of those nut balls…but am on an ULTRA low (almost no) fat diet right now, due to health issues. I do plan on trying the Roasted Chic Peas to take in place of nuts! I was delighted to have stumbled upon your blog after searching something up on Google. All of your treats look so yummy, and best of all, they’re low in calories! However, I was wondering if it would be possible to take out the agave nectar in recipes. What could you use in its place? Would sugar be okay, even though it’s a solid and not a liquid? Thanks! For such a small amount as 1/3 cup, I think you could use 1/3 cup sugar and add 1 tablespoon of water to the batter without any problem. Hope you enjoy! I was looking for something to make/bake for breakfast and this looks perfect. Do you think I can substitute whole wheat pastry flour for the whole wheat flour? Definitely. Whole wheat pastry flour is a great substitute. I used agave and apple juice, and despite wanting to follow the original recipe to a T and having read your warning about not leaving out the lemon juice, I completely forgot to add it until it was too late and I had the batter in the oven. However, the cake turned out as thick as the one featured in your picture–which, I must confess, very rarely happens! It was also delicious and as soon as it cooled down, 3 pieces went straight to the freezer, so that I can enjoy this treat when cherries are no longer in season. Thanks for this recipe, it turned out really well! I loved the bursts of cherries (I might even add more next time) and the hint of spice. I’ll definitely be making this again! If I dont have fruit juice, what could I use in place of it? You could use water with a little sugar in it. The fruit juice is for moisture plus sweetness. Do you think I could sub orange juice for the apple/pomegranate/berry juice? I think that would work, Marcia. love the allspice. Word to the wise, don’t use dry fruit. oops!